I made a reference to the Swinburne Complex awhile back. If you love to swim its a term that crops up in literary circles about those who love to swim. You have to think about how deep the experience of swimming goes for you personally with this particular philosophical theory about swimming and the imagination. Is swimming a driving force for your actions, does it create an addictive mindful calm, is it a outlet for built up steam, is it about just staying fit and healthy, is it for the social friendship and shared comraderie? is swimming a gateway to stimulate expression and a constant seeking of answers about humans and why we are here in nature? So who has it? Well I sometimes think of the Swinburne COmplex as a kind of adrenalin chasing madness as exhibited by say big wave surfer Thomas victor Carroll or anyone who tight rope walks across large open canyons. But really it’s more like the painter Turner who lashed himself to the mast of a ship in order to experience and paint a storm. The Hollywood version is Bodhi in the original Point Break (not the remake!) where the character is inseparable from the element he craves. And Surf photographers mainly come to mind. 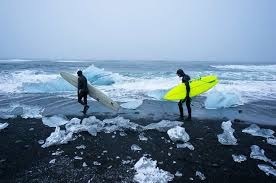 Chris Burkard chasing extreme coldness, Russell Ord sitting deeper in bigger and bigger waves. Writer Tim Winton and Painter Martine Emdur also channel the watery aesthetic in their work. The Reef by The Australian Chamber Orchestra and Richard Tognetti gives this idea a good go but most of my surfer mates do turn their noses up at the classical music and the creaky ants. And it’s set in the desert. tHe Swinburne Complex is specifically about a way the imagination can work -in this case according Bachelard the imagination assigns a value to a substance ie water and there is a creative act born of the experience in the water. 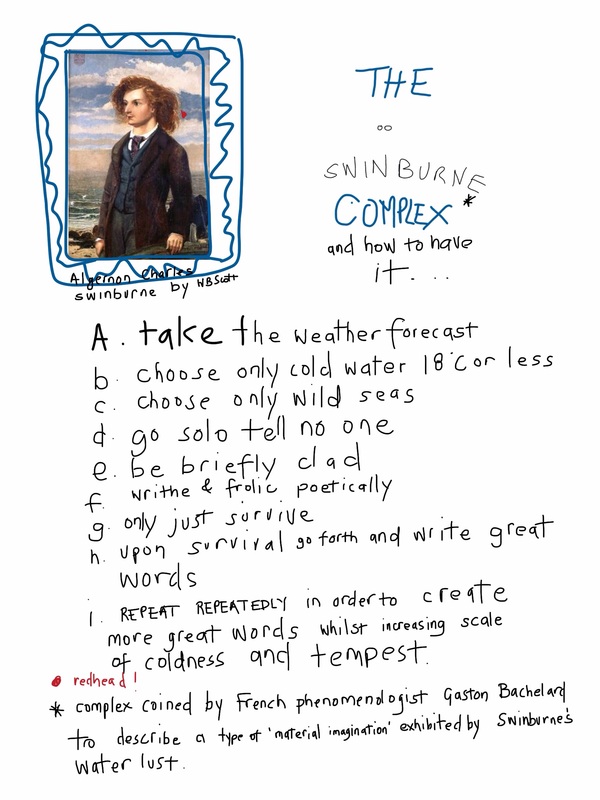 Swinburne was no Romantic aesthete gazing upon a horizon. He was a cold wet poet writing words of beauty inspired by his own humanness and his physical and emotional interaction with the extremes of weather and water. Swinburne used swimming in cold water to calm down any hyperactive nervousness and sexual urges he had going on, and he had LOTS! Google away if you’re curious. Bachelard and his ‘material imagination’ theory is one of my favourites about how creative humans and their thoughts are sensual interpretations of the natural world. I like it because Bachelard singled out swimming in particular and he said of the Swinburne Complex ‘Fatigue is the destiny of the swimmer’ and therefore the swimmer is always courting death. Lots of people write on the subject of our human interaction with the ocean heaps better than myself. two favourites of mine are Fiona Capp’s That Oceanic Feeling, a personal account of ocean love and exploration of another theory called ‘that oceanic feeling’ and surf writer/historian Matt Warshaw’s Mavericks which discusses the shadow of fatigue/drowning and surfing waves of consequence. Never the less PLease Go forth and writhe in cold seas next winter and write great words poetically I say -safely. Thanks for reading these most unpoetic words – summer is coming….